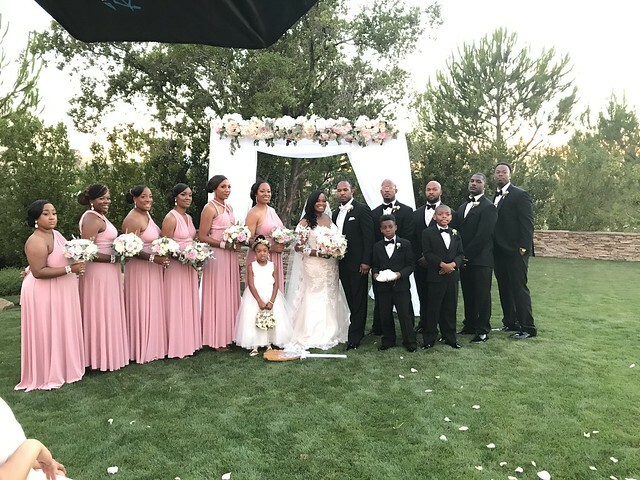 Courtney and Raymond wanted their wedding theme to reflect an elegant and luxury style with plenty of beautiful blush and pastel pink flowers. It was the dream of summer a night wedding at the Club Los Meganos, Brentwood. Courtney reached me out via Wedding Wire, where she found some information about my service. After a first meeting, we created the draft proposal which one organically transformed and changed into a final project with the dream wedding on July 15th, 2017. And now a little bit more details about the bridal bouquet. Courtney carried a formal classical bouquet of garden roses, peonies, roses, freesia and touches of gray foliage with varying textures and the wedding color palette. The bridesmaid’s bouquets were complimenting the pink bridesmaid’s dresses beautifully. Besides that, I would like to show you the boutonnieres and corsages. The Groom’s boutonniere made of the double white ranunculus, the groomsmen boutonnieres arranged of blush spray roses, the wrist corsages made of spray roses and orchids for the mothers and grandmothers. Groom’s boutonniere made of the double white ranunculus with a touch of greens and calcynia. For the flower girls, I made the rose flower purses and the floral crowns. Courtney and Raymond chose to feature their ceremony on the lush green grass in the grounds of wedding venue, having a classic wedding canopy that was accented with a delicate garland of flowers on top. Tall flower centerpieces on glass vases and low centerpieces sat onto white pillars leading out to the divine canopy to meet our gorgeous bride, where Courtney’s lovely man Raymond stood waiting for her. The cocktail hour utilized open space and all guests were able to relax on antique seating and sofas while sipping cocktails and savoring the array of canapes while the bridal party kept taking pictures after the ceremony. The table settings for the indoor reception of dream of summer night wedding presented by a variety of the centerpieces: sets of submerged orchids in the pilsner vases with floating candles and the low flower centerpieces onto the guest tables. In addition to, the head table for the bride and groom and the bridal party had the tall centerpieces, reused bridesmaids bouquets along the table and the long low arrangement for the sweetheart table.